..is when people attribute differences of opinion on policy issues to the other side "not caring." Dan Drezner points out today that in the latest poll from the Council on Foreign Relations, the opinions of foreign policy elites have converged quite a bit with the opinions of the general public. But among the top five items in the poll, there's still one big difference that sticks out like a fire alarm: ordinary people care about American jobs and elites don't. Funny how that works, isn't it? The first thing to note is that respondents are being asked about top priorities, not what issues are important. So it is possible, even likely, the people surveyed thought that domestic employment issues were important but not a priority for our foreign policy efforts. Respondents would likely also have said that (say) protecting domestic free speech rights was not a foreign policy priority, but I bet they would still think that free speech was an important thing they care about. The best analogy I can think of is if someone criticized a Phoenix mayoral candidate for not making Supreme Court Justice selection one of her top priorities. Certainly the candidate might consider the identity of SCOTUS judges to be important, but she could reasonably argue that the Phoenix mayor doesn't have much leverage on that process and so it should not be a job-focus priority. But the second thing to note is that there is an implied policy bias involved here. The Left tends to take as a bedrock principle that activist and restrictive trade policy is sometimes (even often) necessary to protect American jobs. On the other hand many folks, including me and perhaps a plurality of economists, believe that protectionist trade policy actually reduces total American employment and wealth, benefiting a few politically connected and visible industries at the expense of consumers and consumer industries (Bastiat's "unseen"). 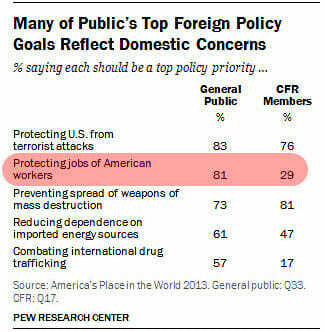 Because of the word "protecting", which pretty clearly seems to imply protectionist trade policy, many folks answering this survey who might consider employment and economic growth to be valid foreign policy priorities might still have ranked this one low because they don't agree with the protectionist / restrictionist trade theory. Had the question said instead, say, "Improving American Economic Well-Being" my guess would be the survey results would have been higher. Whichever the case, there is absolutely no basis for using this study to try to create yet another ad hominem attack out there in the political space. People who disagree with you generally do not have evil motives, they likely have different assumptions about the nature of the problem and relevant policy solutions. Treating them as bad-intentioned is the #1 tendency that drags down political discourse today. Postscript: This is not an isolated problem of the Left, I just happened to see this one when I was thinking about the issue. There likely is a Conservative site out there taking the drug policy number at the bottom and blogging something like "Obama state department doesn't care about kids dying of drug overdoses." This of course would share all the same problems as Drum's statement, attributing the survey results to bad motives rather than a sincere policy difference (e.g. those of us who understand that drugs can be destructive but see the war on drugs and drug trafficking to be even more destructive). My post wasn't about the "other side." It was about the gulf between elites and everyone else. There's abundant evidence that elites, even fairly liberal elites, simply don't take seriously the concerns of low earners. It shows up in all sorts of places, from trade treaties to Social Security to unemployment. Honestly, I think it's a hard phenomenon to deny. Kevin Drum's comment here shows he still doesn't get the issue. Ascribing motive is a logical fallacy, and an indicator that the argument is factually weak. Changing the target, as Kevin does here, does not improve the argument. If Kevin wants to argue that trade policy could be adjusted to improve the wages of low income workers, then he should make his case using persuasive facts and logic. Instead he argues that "elites don't care about the poor as much as I do". Gee, Kevin, I wonder if that might have something to do with the anti-capitalist class warfare narrative fire you and your fellow dimwit leftists have been furiously fanning for the past decade? Seems to have backfired a bit, now that your policies seem to have exacerbated the problem. It can be argued nothing can be done to improve low-income workers. Either you are highly-productive or you are not. Until you learn how to get highly-productive skills then you will always be a low-wage worker. In other words, it's up to the individual to learn new skills and no one else's. I hate to do this, but I'm desperate for answers and for help. Last week I went to comment and got a no can do message from Disqus saying that Mother Jones was blocking me. I checked my account and found that the last month of my comments were deleted. Since then I've emailed MoJo at least once a day, phoned (left msg), and I still have no reply. I'd just like to know what I did wrong. MoJo is the only place I comment, because I learn as much from the community as I do the staff writers. I can only surmise that the reason I've been blocked is that I objected to Patrick Caldwell's "reporting" on Secretary Clinton. Ironically, the day after I was blocked, you cited in 3 separate blog posts about other writers (Ron Fournier for example) and their biased reporting. Anyway, since you are fair (some say to a fault) and definitely honest, I hope that you can at least get someone from MoJo to tell me why I've been blocked. Since I think unfairly so, I'd prefer to have the block lifted. Hi Art, I was wondering what happened to you! I went looking for a comment that I could reply to just to see if everything was OK in your world, and I found this ↑. That explains it, and yet it doesn't. I've never seen a comment of your's that warranted banishment! Certainly not compared to some of the dreck that gets posted. Anyway, I miss your intelligent, funny contributions - hopefully you'll get things straightened out. Take care! Thanks for your kind words. I miss our little MoJo community. Especially you (and some of our other friends). One of my greatest joys was reading and upvoting your comments. I always admired your intellect and delighted in your sense of humor. And of course, your openness and frankness disarmed me from the first. "...a lying sack of cuss." At least, that was the closest I got to being vulgar (that day). I can only surmise. It's so depressing, I can't even muster a Dan Hicks reference. Enjoy The Doors here. Yuck! Hate that I left with The Crystal Ship. I'd just watched a doc about The Doors. Hey Art. I stumbled upon this looking at some past discussions. I've been wondering where you've been. Sorely missed over at MoJo. You gotta be kidding me? I still read MJ. And I scan the comments threads to look for the smart, witty, and compassionate LittleLion8U. Spent 1st 2 weeks emailing and phoning MJ asking why I'm blocked. It's either I called Patrick Caldwell a lying sack of cuss, or taunted a forced birther with his group's terrorist connections. (One of the things that made me happiest was getting a paws up from you). Maybe next week. I actually have a snail mail ltr enroute to MJ. Raw Story's - and it's readers' - loss. You must have been upset as well as perceptive. I don't recall you ever playing in the gutter with us crass people before. I've yet to hear from MoJo, but this is clearly an indication that I was blocked for being a bad influence. "I don't give them Hell. I just tell the truth about them and they think it's Hell."